We are affianced in offering wide assortment of Chain Pulley Block.Specifications for a chain pulley block include following items. Lifting Capacity (Safe Working Load). Number of falls of load chain. Effort on hand chain to raise safe working load. Weight of Chain pulley block assembly for 3.0 meter lift. We are affianced in offering wide assortment of Chain Pulley Block. Specifications for a chain pulley block include following items. Extra weight for each additional meter lift. 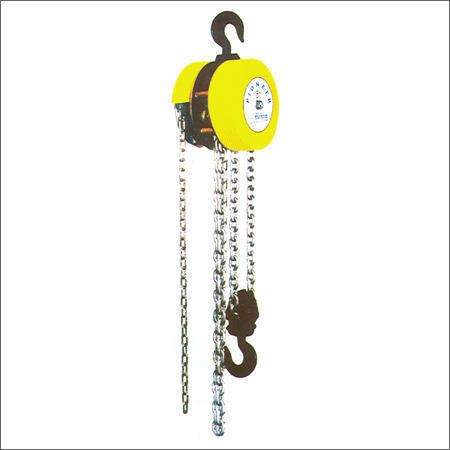 Effort on hand chain to raise safe working load by one reputed Indian manufacturer for various capacity of chain pulley blocks is as under. Light chain pulley blocks and chain blocks requiring less pull on hand chain may be selected for easy of operation. Oriental Tools Company, established in 1975, is focused on providing complete industrial and automobile aftermarket maintenance tools, equipment and customized storage and tool kits. We cater to Automotive, Hospitality, Educational Institutes, OEMS, Manufacturers and DIY users as well. A company that focuses on understanding Customers application, and provides the most optimum and cost effective solution. We are one of the well-known Retailer, manufacturer and Supplier. We have the Ability to source even the most exotic tools from any part of the world. We Stock over 1500 Products in our warehouse, and with tie-ups with major shipping services providers can supply to any part of India at reasonable costs.